Not all forays into politics are equal. Two companies in the news in the past few days highlight this lesson. The Silent Majority has spoken. This is the story of In-n-Out versus Nike. Let’s start with In-n-Out Burgers. Liberals decided to call for a national boycott because In-n-Out committed the “sin” of donating to the GOP. How idiotic is the idea of boycotting a company for making a political donation? Almost every company, even the small businesses you buy from, is run by someone who has a political opinion. Having that opinion is protected by free speech clause of the U.S. Constitution. It’s what America is all about. It’s what so many millions of young Americans have died for on bloody battlefields all over the world. Most businesses, or their CEOs give political donations. Again, that is protected by free speech. Again, that is as American as apple pie. Most of us never know who the businesses we buy from donates to. Or care. If I like a product, I’ll buy it. I don’t care who you donate to. But boycotting businesses who give to the GOP is idiotic. First, the GOP controls the Presidency, Senate, House, a large majority of Governors, Lt. Governors and state legislatures. In short, the GOP dominates America. As a matter of fact, polling proves “conservatives” outnumber “liberals” in 47 out of 50 states. Secondly, the GOP is pro-business, pro-Capitalism, and as Trump has proven (just like Reagan before him) great for the economy, jobs, small business and the average middle class American worker. So, how can it be a “sin” for a business to donate to the GOP. We are benefiting from GOP policies. So are the majority of our customers. That’s precisely why consumer confidence is the highest in 18 years. Thirdly, polls prove small business owners are the 2nd most optimistic in modern history. Only Reagan made them happier and that was almost four decades ago. Like it or not, the owner of almost every small business you buy from is a Republican and fan of Trump. So, you think you’re going to boycott all 28 million small businesses in America? For donating to the party that’s great for the economy, helps our businesses succeed? Good luck. That could be why the In-n-Out boycott failed so disastrously. No one cares about a political donation. But now we come to corporation number two. Nike. They just made a disastrous decision. And they will pay for it with a massive sales decline and billions in lost stock value. Nike may have fatally damaged itself this week. Nike didn’t make a political donation. I couldn’t care less about that. But Nike just made former NFL quarterback Colin Kaepernick the face of their company. That is a combination of stupid, ignorant, offensive and tragic. Nike just sided with what half of America (and all 63 million Trump voters) thinks is a vile, ungrateful, America-hater. Now that’s bad business. Here’s a guy who had a $150 million contract, but thinks America is “unfair” to minorities. Here’s a guy who spits in the face of vets, cops and our flag. Here’s a guy who gives the black power salute at the US Open days ago- from a luxury box. What a joke. What a clueless hypocrite. What a disgrace to America. You’d think Nike would have learned from the NFL’s terrible decision to allow players to kneel for our national anthem. The NFL lost hundreds of millions with massive ratings declines, empty seats and lost merchandise sales. Kaepernick was the face of that disaster. 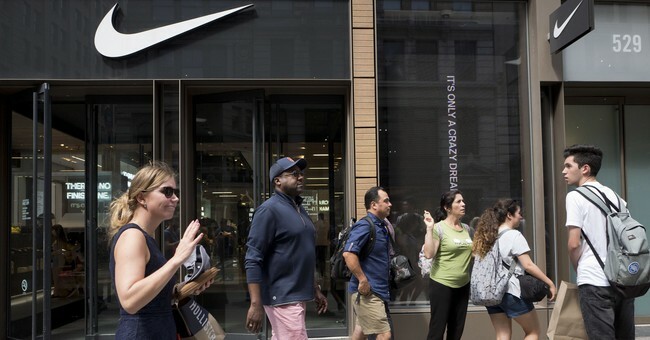 As I write this column, Nike stock is down by billions, thousands of Americans are burning Nike sneakers and millions are vowing to never buy anything from Nike again. Now the same ingrate who almost brought down the NFL will cause massive damage to Nike. In-n-Out is in great shape. Nike just destroyed a billion-dollar brand. The Silent Majority have spoken.